Om Beach This beach shaped in the form of the Hindu spiritual letter 'Om' is a major attraction with tourists. A clean beach with clear waters, Om beach offers spiritual and emotional fulfillment to its visitors. 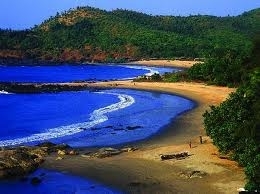 Here's the our members favorite photos of "Beaches near Gokarna". Upload your photo of Om Beach! Connect with Aakash Garg, Gee Kay and 3 other members who have already visited Om Beach.